You need another option for that healthy carbohydrate at dinner? Well, you should add these to your lineup! I must admit, I was a bit skeptical of how these would turn out. I wasn’t so sure that the grill would really be much of a compliment to the sweet potato. However, I had to give it a try because I knew the calories would be ideal. I gotta say . . . I was pleasantly surprised. The grill gave these a fantastic flavor and left me wishing that my portion size could be doubled. You can choose to cut these into 1/2-inch thick pieces or leave them at 1-inch thick pieces. To no surprise, they cook up a little faster if they’re only 1/2-inch thick. Just do your best to get them all the same thickness so that they’re all done at the same time. *Note: The key to this recipe is cutting all the sweet potato pieces as close to the same size as possible that way they cook evenly. Also, feel free to add other spices to fancy them up a bit. Chili powder and cumin for a southwest kick anyone? Place all of the sweet potato chunks in a large microwaveable bowl. Cover with plastic wrap and microwave for three minutes. Remove from the microwave, stir, recover with plastic wrap and microwave 2-3 minutes more, until the sweet potatoes are just tender enough to thread on skewers (but not overly soft – they will cook through on the grill). If any liquid is left in the bowl holding the sweet potatoes, drain it off. Drizzle sweet potatoes with olive oil, sprinkle with salt and pepper, and then lightly toss to coat sweet potatoes. Thread pieces of sweet potato on each skewer. Preheat a charcoal or gas grill to medium or medium-high heat. 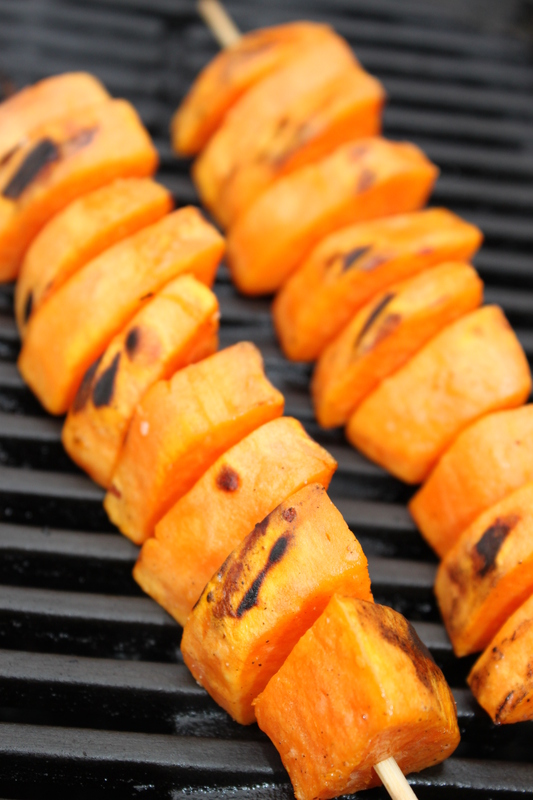 Grill the sweet potato skewers, flipping every 5-6 minutes, for a total of about 15-20 minutes, until the sweet potatoes are tender. They are good with a little bit of rosemary too.